I heard a story about President Truman last week that dealt with his role in recognizing Israel as a nation shortly after Israel became a modern Jewish nation. I decided to check it out. I present to you a couple of gleanings from the internet. The first is from the Skirball Museum in Los Angeles. To mark its celebration of the 50th anniversary of Israel, the Skirball Museum borrowed some very special objects from the Truman Library in Independence, Missouri -- a Torah, a Torah case, a manuscript, two busts, a pair of glasses, a cane, and a replica of a desk plaque. Why does a Jewish museum in Los Angeles have to ask an institution in America's heartland to lend a Torah, or a Torah case? These particular ones had been given to Harry S Truman by Israeli President Chaim Weizmann in recognition of the U.S. President's decision in 1948 to recognize the new State of Israel. 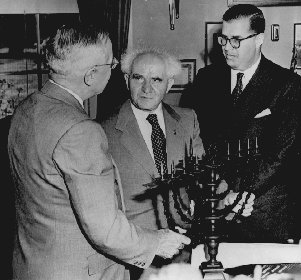 The small Torah was presented at the White House to Truman only 11 days after Israel became independent. According to Larry Hackman, director of the Truman Library who was on hand for the opening of the Skirball exhibit last week, "Truman hadn't been briefed by his staff and didn't know what a Torah was. He sort of looked at it, then looked at Weizmann and said, 'Thanks, I've always wanted one of these.'" 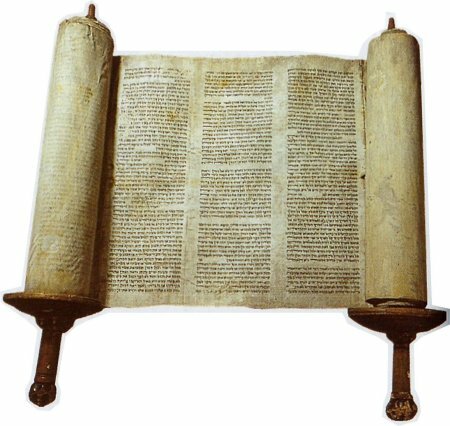 By 1956, three years after leaving the Presidency, Truman was very much aware of what a Torah was and its symbolic importance, Hackman added in an interview. He quoted Abba Eban, who in 1956 was Israel's ambassador to the United States, telling of Truman showing him the Torah and saying 'This is my prized possession.'" A picture of Truman and Weizmann with the Torah is the cover photograph of a brochure issued for the small exhibit. It is an appropriate illustration for a booklet which argues that it was Truman's religious convictions about Israel--and not political considerations--which persuaded him to overrule his popular Secretary of State George Marshall and to extend de facto recognition to Israel within a quarter of an hour after David Ben-Gurion declared the Jewish state to have come into existence. De Jure recognition was granted in 1949 after Israel swore in its first government. Inside the booklet an essay by Michael T. Benson, author of Harry S Truman and the Founding of Israel, noted that by the time Truman was 14 years old he had read the Bible cover-to-cover at least four times. "As one reviews the record, it is apparent that Truman's conversance with the history of the Middle East and his knowledge of the Bible played a significant part in his attempt to formulate his own presidential policy toward Palestine," the historian wrote. "He was heavily influenced by a biblical upbringing well-larded with Judeo-Christian themes and by a Baptist training that stressed a Jewish return to Zion. Truman's favorite psalm, number 137, is illustrative of this background: 'By the rivers of Babylon, there we sat down, yea, we wept, when we remembered Zion.'" Benson went on to argue that Truman "insisted that the Old Testament had made a commitment to the Jewish people that someday they would have a homeland of their own." A touch screen exhibit at the Skirball Museum features a videotaped conversation with George Elsey, a deputy in 1948 to Truman's presidential aide Clark Cifford. It was the lawyer Clifford who in a legendary Oval Office showdown debated Marshall over the appropriateness of recognizing Israel. "In February of '48, just three months earlier, Harry Truman sent his civil rights message to Congress, the boldest, bravest, message on civil rights that any president had ever sent to the Congress. It laid out the ground rules for the debate on civil rights in this country for the next 30 years. Would you say that he was just doing this for the Black vote? No he did it because he believed it was the right thing to do, despite the consequences. And one of the consequences, in the case of civil rights, was the defection of a large part of his party -- the Democratic party. I think there's a degree of comparability here. He did what he knew was right. Sure, there were some political advantages to it, but there were enormous disadvantages. "In the case of Israel," Elsey added, "there were some political advantages, but there were a great many negatives as well. In both cases, he was doing what he believed was the right thing for the nation, for the American people..."
Hackman, the Truman Library director, suggested that although Truman was a modest man, not given to expressions of grandeur, he may have voiced his true feelings about recognizing Israel, years after leaving office. When a person complimented him for being "important" to the creation of the State of Israel, he responded sharply, "Important, hell! I am the American Cyrus." Cyrus was the Persian ruler who defeated the Babylonian ruler Nebuchadnezzar and allowed the Jews in 538 BCE to leave their captivity and to return to Zion, exactly as they had prayed to do in Truman's favorite psalm. Grace Cohen Grossman, the Skirball's senior curator, pointed out during an interview that prior to Truman's decision to recognize Israel, the American president was lobbied heavily by American Zionists. She said Truman told them "it is not about getting your vote; lobbying in this regard won't help." In fact, the curator added, in the subsequent 1948 election against Republican presidential candidate Thomas Dewey, Truman "lost New York and Pennsylvania, two states where there were large Jewish communities, yet still won the election." 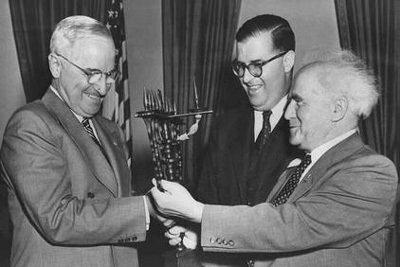 The Sephardic style Torah case fromWeizmann was presented to Truman by Eliyahu Elath, Israel's first ambassador to the United States and predecessor to Eban. A bust of Weizmann also was loaned to the Skirball from the Truman Library, but the bust of Truman, himself, came not from the Truman Library but from the Lyndon B. Johnson Library. Grossman explained that the Truman Library needs such a bust for its permanent exhibit, while the Johnson Library does not. Another exhibit borrowed from the Truman Library was "a manuscript of Exodus given to Truman by Leon Uris," its author. The novel about Israel's struggle for independence is turned to a page describing Israelis listening to the news over the radio that the British mandate in Palestine has come to an end. "My favorite part as a curator, in terms of feeling a personal link to Truman, is that we were also able to borrow his glasses and cane," Grossman said. "He was well-known for walking with a walking stick and there is something about touching the actual glasses used by a President. Of course, this (plaque) is a replica of the famous motto 'The Buck Stops Here' which is part of the lore of Truman." This is an excerpt of an article from Dave Kopel in the National Review. In the latest issue of Books & Culture, a Christian book review monthly, details the role of Truman's Southern Baptist faith in his Israel policy. While mainline Protestants (with some important exceptions, such as Schlesinger's friend Reinhold Niebuhr) tended to disparage Zionist hopes for a Jewish state, religious conservatives (a group that included people like Truman who were not necessarily political conservatives) rejoiced in Zionist aspirations as the fulfillment of prophecy and the just restoration of the Jewish homeland which God had promised the Jews by sacred covenant. Only hours after the declaration of the State of Israel, President Truman overrode the objections of the State Department and the War Department, and made the United States the first nation to grant recognition to Israel. Truman used American clout to convince the U.N. to recognize Israel, too. When ceasefire lines were being drawn after the failed Arab war to exterminate the Jews, Truman insisted that Israel have the Negev, which more than doubled Israel's territory. Israelis believed that without Truman they would not have survived. As recounted in the Second Book of Chronicles, in the 6th century B.C. the Jewish kingdom was conquered by the Babylonian Empire, the Temple was destroyed, and the Jews were carried into Babylonian captivity. Half a century later, the Babylonian Empire was overthrown by the Persian Empire of Cyrus the Great. Cyrus allowed the Jews to return to their holy land.